The United States has the second highest marginal effective tax rate on corporate investment in the developed world at 35.3 percent—behind only France. While the U.S.’s marginal effective tax rate has remained stagnant around 35 percent over the last 10 years, the average marginal effective tax rate on corporate investment has fallen by 2.9 percent in the OECD and 6.8 percent in the G7. Since 2005, 63 countries have cut their statutory corporate tax rate, lowering the average statutory tax rate to 24.4 percent across the 95 countries surveyed. Meanwhile, the U.S. corporate tax rate has remained stagnant at above 39 percent. The lack of U.S. corporate tax competitiveness reduces investment and economic growth, undermines productivity, and encourages companies to move business to other countries. Options to reform the U.S. corporate tax code include: reducing the top rate to 25 percent, limiting tax preferences, moving to a territorial tax system, and improving the integration of the individual and corporate tax codes. If there is one point of common agreement among the Democratic and Republican parties, it is the need to reform the corporate income tax code. Congressional Republicans have recommended reducing the federal corporate tax rate from 35 to 25 percent while President Obama has recommended a 28 percent rate. Both would look at removing a number of tax preferences. The lack of U.S. corporate tax competitiveness, which is documented below, imposes three serious harms on the U.S. economy. First, the high corporate tax burden reduces the incentive to invest in capital in the United States, thereby undermining growth. While undoubtedly U.S. businesses will invest at home in response to other important factors—such as domestic demand—private investment would be larger in the United States if the tax burden on investments were reduced. Canada, for example, has sharply reduced its business tax burden since 2000, moving from the highest tax burden to the middle of the pack among countries in the 34-member Organization for Economic Cooperation and Development (OECD). The result has been an improvement in private sector investment in the past decade and growing incomes for Canadians. Second, the wide variation in effective tax rates among different business activities in the United States undermines productivity. With a non-neutral corporate tax system, capital is allocated to tax-favored activities with other activities subject to significantly high effective tax rates. A reform of the corporate tax base so that corporate taxable income matches economic income more closely would lead to a shift in capital allocation from lower to higher economic returns. Productivity can be improved by making the business tax structure more neutral with similar tax burdens on business activities especially with respect to asset, industry, and business organizational choices. These gains are about 50 cents to 85 cents per dollar of corporate income tax revenues, which are in addition to the economic cost arising from the discouragement of aggregate investment. Third, a high statutory corporate income tax rate reduces the incentive to keep profits in the United States. Companies will shift income to jurisdictions with lower corporate income tax rates, compared to the existing federal and state corporate income tax rate of 39.1 percent. As tax planning can be swiftly put in place—such as shifting debt deductions into the United States from other countries—the U.S. federal and state treasuries are hurt with lower corporate tax revenues. The incentive to keep cash abroad is further aggravated by the U.S. practice, now unique among major industrialized economies, to tax foreign dividends remitted back home. A policy of reducing statutory corporate income tax rates to the typical rates found in other countries with base-broadening would enable the United States to encourage investment without compromising revenues. As we discuss below, the Canadian experience with corporate rate reductions—almost 16 points since 2000—with some curtailment of tax incentives has maintained corporate tax revenues as a share of GDP and at a level higher than what is found in the United States. This paper provides new 2014 estimates of the tax burden on investments in the United States compared to G7, emerging G20, OECD, and 95 industrialized and developing economies. The tax burden takes into account corporate income taxes (rates, depreciation, inventory, and other tax deductions and credits), sales taxes on capital purchases (including U.S. state retail sales taxes on capital goods), and other capital-related taxes including franchise fees, asset-based taxes, and financial transaction taxes. We exclude property taxes since data are not available to estimate industry-specific and asset-specific effective property tax rates, net of charges for municipal services, in most countries including Canada. We exclude temporary incentives such as bonus depreciation in the United States since these temporary incentives tend to shift investment from one year to the next rather than provide sustained reductions in the cost of capital on a permanent basis. This year marks the tenth anniversary of a global comparison of estimated marginal effective tax rates for manufacturing and service industries in developed and developing countries. We use the METR methodology to estimate tax burdens based on work developed over the years to account for various complexities in the tax system. The marginal effective tax rate is computed for new investments as annualized value of tax paid as a percentage of the pre-tax rate of return of capital under the assumption that the after-tax return is just sufficient to attract finance from international (G7) investors. For example, if the net-of-risk pre-tax rate of return on a marginal project is 10 percent and the global after-tax return is 5 percent, the effective tax rate on capital is 50 percent. To update our cross-border tax comparison annually, we not only incorporate the legislated tax changes on an annual basis but also update the key non-tax parameters by country including capital structures, interest rates, country-specific inflation rates and GDP shares by sector—based on the latest statistics available. Applying these updated non-tax parameters to all the years contained in our latest model (2005 to 2014) helps keep intact our tracking of annual tax changes by country. Doing so, however, may result in variation in country-specific METRs for previous years, as between our current and earlier publications. The United States tax competitiveness position has worsened over the years. Although there has been some reduction in the statutory tax rate for manufacturing and other qualifying industries as well as changes in various allowances and tax credits, the U.S. federal and state governments have roughly maintained the same aggregate tax burden on business investments since 2005 (see Table 1). Over the same time period, other countries have moved to reduce the corporate tax burden, including most G7 countries except France. On average, the G7 countries have reduced the corporate income tax rate by 4.4 percentage points from 2005 to 2014. The emerging G20 countries have, on average, reduced corporate tax rates by 3.1 percentage points, from 29.3 percent in 2005 to 26.2 percent in 2014. Countries in the OECD have reduced corporate tax rates by 2.8 percentage points. Meanwhile, the U.S. statutory corporate tax rate has dropped by 0.2 percent, due to corporate tax changes at the state level. In some countries, part of the corporate tax relief has been offset by the removal of certain tax preferences. *The 10 emerging economies withn the G-20 include two OECD and eight non-OECD countries; they are (in alphabetic order): Argentina, Brazil, China, India, Indonesia, Mexico, Russia, Saudi Arabia, South Africa and Turkey. **Numbers may not add up due to rounding. In 2014, the U.S. has lost its distinction as having the highest marginal effective tax rate on capital among industrialized economies (see Table 2). That distinction now belongs to France, which doubled its surtax on corporate incomes on January 1, 2014 (10.7 percent for the largest companies). Although France’s corporate income tax rate including the surtax is 38 percent, and below the U.S. federal-state rate of 39.1 percent, France levies several other taxes on capital investments that results in a rather high marginal effective tax rate. France has indicated that it plans to reduce its corporate tax rate by 2020 to 28.92 percent from 34.43 percent as well as eliminate its “temporary” surtax that has been in place since 2011. Unlike the United States and France, other G7 countries have been reducing their tax burden on business investment (Table 2). The most aggressive actions have been taken in Canada and the United Kingdom. Canada has lowered its METR by over half from 38.8 percent in 2005 to 18.8 percent in 2014. It has done so by reducing corporate income tax rates almost 8 percentage points, removing capital taxes, and eliminating most sales taxes on business inputs through provincial sales tax harmonization with the federal Goods and Services Tax (a form of value-added tax) in six provinces. To soften the effect of the Global Recession in 2008 and 2009, the United Kingdom has pushed further corporate tax reform by lowering rates and broadening the tax base. By 2015, the UK corporate income tax rate will be 20 percent, sharply lower than 30 percent in 2007. Germany has also reduced its tax burden on investments since 2005. It has reduced its METR by almost 10 percentage points and lowered its corporate income tax rates from 38.9 to 30.2 percent. Italy has followed a similar course with quite significant reforms over the years. Additionally, Japan, which has typically levied one of the highest tax burdens in the world, has reduced its METR on business investments by over two percentage points since 2005. It plans a further reduction in the federal corporate income tax rates from the 2014 level of 37 percent to 33.8 percent in the next two years. Other OECD countries reduced the tax burdens on business investments in 2014 or have plans to do so, including Denmark, Finland, Norway, Australia, Spain, and Switzerland. Some have increased or plan to increase the tax burden on capital, including Chile, Greece, Israel, Korea, and Portugal. Overall, the GDP-weighted OECD average METR has fallen from 31.4 percent in 2005 to 28.2 percent in 2014. * Weighted by the average GDP for 2008-2012 in 2005 constant US dollar. Taking into account all 95 countries that we examine, a similar story evolves (Appendix Table 1). In general, the GDP-weighted tax burden on business investments has fallen from 28.7 percent in 2005 to 22.1 percent in 2014. The GDP-weighted average statutory corporate income tax rate among the 95 countries has fallen from 42.2 percent to 33.0 percent during the same period. The simple average corporate income tax rate has declined from 28.8 percent in 2005 to 24.4 percent in 2014. The United States and France enjoy a Third World country standard with high tax burdens on capital similar to Argentina, Chad, Uzbekistan, and Colombia. Even manufacturing, a favored industry for tax relief in the United States, is more heavily taxed than the international average (33.5 percent in the U.S. compared to weighted average of 22.4 among the 95 countries). Whether one looks at the corporate income tax rate alone or the overall tax burden on businesses, the United States has been exceptionally out of step with the rest of the world. While the U.S. has stood pat, most countries have reduced corporate income tax rates to be internationally competitive and removed some tax preferences for capital investment to achieve a more neutral tax system. A close look at average effective tax rates demonstrates the poor performance and unstable revenue collection from the U.S. corporate tax for the period of 2000 to 2011. 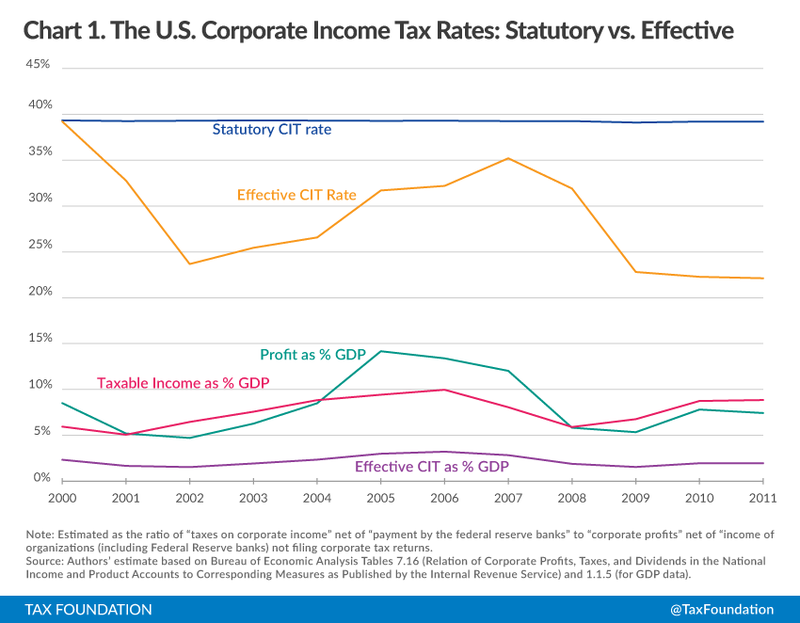 As shown in Chart 1, the average effective tax rates—corporate taxes divided by corporate profits—are well below the statutory tax rate, reflecting numerous tax breaks. In the latest year available (2011), the effective tax rate of 22.1 percent is less than three-fifths of the statutory tax rate. The source of these differences is related to tax preferences such as various investment tax credits as well as the use of past losses created by the recession in 2008 and 2009. Moreover, revenue collections are highly variable as effective tax rates move cyclically with the economy. The highest effective tax rate was in the 2007 when the economy peaked with lowest effective tax rate in 2009-11, reflecting, in part, lower corporate profits and taxable income in those years. The U.S. corporate income tax, as a share of GDP, averaged 2.2 percent of GDP for the 2000 to 2011 period. This is in sharp contrast to its northern neighbor, Canada, which collected far more corporate income tax revenues than the United States at roughly 3.4 percent of GDP during the same period (Chart 2). This is true even though the U.S. has a sharply higher general corporate income tax rate than Canada. 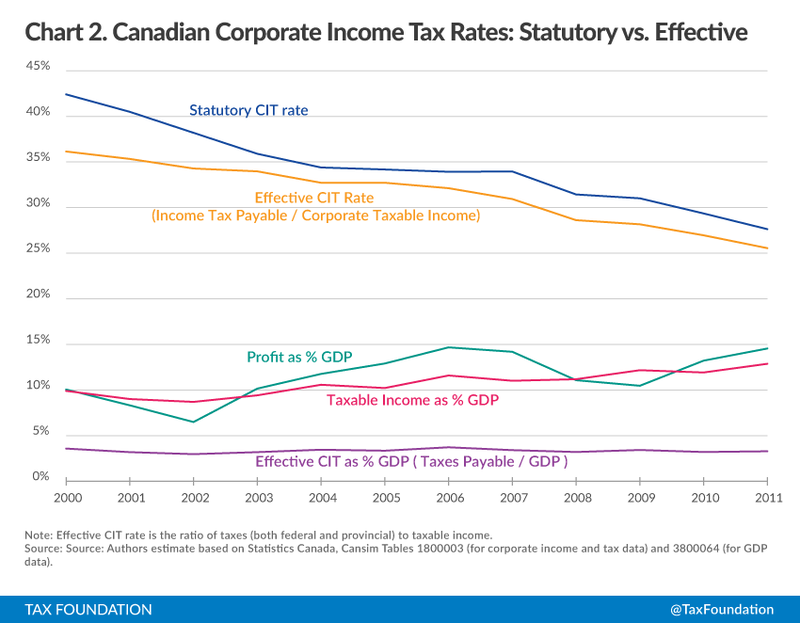 The Canadian corporate tax revenue performance is particularly impressive since statutory corporate income tax rates fell roughly 15 percentage points during this period. Unlike the U.S. case, Canada has enjoyed rising taxable income as a share of GDP even during the recession, when corporate profits dropped precipitously. The strategy of the high-rate, narrow-base corporate tax employed by the United States has failed—the corporate tax is highly distortionary and has been a poor revenue collector. The pursuit of a different strategy—internationally competitive corporate tax rates and neutrality—is a far better prospect for reform. Integrity of the Income Tax: Without the corporate income tax, individuals avoid personal taxation by leaving income in the corporation. The role of the corporate tax is to serve as a backstop to the income tax since not all forms of personal income, particularly capital gains, are fully subject to tax. Personal income taxes on dividends and capital gains should be reduced to avoid double taxation of distributed or reinvested profits (the latter leads to an increase in shareholder value that is taxed as capital gains when assets are disposed). The rise of pass-through entities in the United States that are not subject to corporate income tax, exemplifies actions taken by investors to undo double taxation in the income tax system. Withholding income from foreign investors: The corporate tax serves as a withholding tax on income accruing to foreigners by American corporations. Without the corporate income tax, the U.S. government loses an important source of revenue garnered from foreign corporations earning income in the United States. Surrogate User Fee: In the absence of user fees charged to recover the full cost of public services, the corporate income tax operates as a surrogate to capture the profit gains to businesses from public services such as public transportation and worker training. U.S. companies (and certain pass-through entities) also benefit from the limited liability that enables businesses to raise funds from shareholders at a more favorable cost. Other economic objectives might be pursued by governments in shaping corporate tax policy such as providing targeted tax relief to certain business activities. However, if public intervention in the economy is desired, it is far from clear that tax incentives, which are broad in their impact, are an appropriate approach to conduct economic policy, instead of government regulation and spending programs. After all, preferential tax relief will not be effective if investors were already planning to undertake the activity. Two approaches could be considered for corporate tax reform: cash flow taxation or income taxation. The first is to move towards a “cash flow” tax in which the full economic cost of an investment is deducted from the tax base. At the margin, the annualized return on capital is equal to the cost of capital so this implies that the corporate tax payment on marginal projects will be zero and, therefore, would not affect the decision to invest. Under a simple cash flow tax, capital investment costs would be expensed and, in the standard treatment, the cost of financing the investment through borrowing would not be deductible by the borrower unless it is taxable income to the lender (which will not necessarily be the case with tax-exempt investors and foreign investors). If interest is fully deductible, cash flow corporate tax reform would require personal tax reform to ensure that interest income is fully taxable at the personal level. In this paper, we focus on corporate tax reform under income taxation as the most viable U.S. reform at this time. The alternative approach is to reform the existing corporate income tax to make it more neutral with similar tax burdens on business activities. This would reduce the variation in marginal effective tax rates on assets and industries. Currently, even without temporary bonus depreciation, marginal effective tax rates on capital investments are highest on trade and service industries and lowest on public utility and transportation investments. Structures are almost twice more heavily taxed than machinery in manufacturing. Investments in land are least taxed among all industries. Inventories are somewhat less taxed on average than machinery and equipment in most industries although to the extent that firms use the historical price of the oldest dated inventory to assess its cost, inventories would be one of the more highly taxed assets. With this background, U.S. business taxation requires substantial reform to lower rates and broaden tax bases. Corporate tax reform in the United States is a challenge since so many businesses operate as pass-through entities, resulting in business income being only subject to personal taxation. Policies to broaden the tax base such as the curtailment of depreciation allowances and investment tax credits not only affect corporations but also pass-through entities—yet only the corporate tax rate is reduced if reform only focuses on the corporate tax. Therefore, an important aspect of corporate tax reform is to reduce differences in the tax treatment of incorporated and pass-through entities, which includes removing the incentive for firms to shift out of the corporate sector altogether. Below, several corporate tax reforms are briefly described on the basis that other taxes, particularly the personal income, remain unchanged. This is the top priority for tax reform in the United States. The U.S. federal rate at 35 percent reduces the incentive to invest as well as makes it difficult to attract profits to the United States. A lower corporate income tax rate will encourage investments, reduce the tax value of preferences provided to business—which will improve neutrality—and keep profits in the United States. Including state-level corporate taxes, the overall federal-state rate would be roughly equal to 30 percent, close to the global weighted-average corporate tax rate. Tax preferences, including the preferential tax rate reductions for qualifying businesses, bonus depreciation, and various tax credits, should be scaled back to achieve a more neutral business tax structure with similar tax burdens on business activities. Neutrality would improve economic incomes, as businesses will decide upon investments according to economic value rather than being influenced by tax relief. Base broadening would also simplify the tax system, since rules that clutter tax law are needed to determine qualifications for tax relief. The U.S. is the only major capital exporting country that imposes U.S. tax on dividends remitted from affiliates of U.S. multinationals operating in other jurisdictions (a worldwide tax system). Although some proposals have been made to fully tax profits earned by foreign affiliates, this would be considerably disruptive to U.S. companies whose foreign shareholders would prefer to invest directly in companies operating in other jurisdictions, rather than receive such income through a U.S. corporation. The effect of the existing U.S. tax on foreign income is to discourage cash from being remitted to the U.S. to fund investment as well as encourage foreign takeovers of U.S. companies (including corporate inversions where the U.S. company moves abroad to avoid the tax on foreign income). Under a foreign dividend exemption system, rules would be required to reduce the scope of tax planning to shift profits out of the United States. This is becaus the federal-state corporate income tax would still be higher than most OECD countries, even under proposals with a 25 percent corporate income tax rate. Corporate taxation is an additional tax on dividends and capital gains. While the U.S. has provided some tax relief for dividends and capital gains at the personal level in recent years, the effective tax rate results in a higher tax on such income compared to the tax on ordinary income. The double taxation of dividends and capital gains encourages too much debt financing by U.S. businesses as well as the adoption of other business structures to avoid U.S. corporate tax. If the corporate income tax rate at the federal level were reduced to 25 percent, the combined corporate and personal tax on distributed profits for high-income investors would be about 40 percent, roughly equal to the federal top rate on personal income. This could encourage businesses to shift back to the corporate structure for tax purposes. The United States is falling behind other countries with respect to the competitiveness of its corporate income tax system. While the U.S. federal and state governments have roughly maintained the same aggregate tax burden on business investments since 2005, other countries have moved to reduce the corporate tax burden including most G7 countries except France. The U.S. METR on capital is 35.3 percent, second highest among G7, OECD, and emerging G20 countries. Among our 95-surveyed countries, the U.S. tax burden on business is sixth highest—only below France and several Third World economies—and double that of the average tax burden in the world. The United States has also failed to reduce its corporate income tax rate—one of the highest in the world—resulting in companies shifting their profits out of the United States. On average, the G7 countries reduced the corporate income tax rate by 4.4 percentage points between 2005 and 2014. This is somewhat more than the emerging G20 countries that have, on average, reduced corporate rates by 3.1 percentage points. Similarly, the OECD countries have reduced rates by 2.8 percentage points. Some of the corporate tax relief has been offset by the removal of certain tax preferences in some countries. The United States is prime for corporate tax reform. Instead of following a failed strategy of high rates and narrow bases, the U.S. federal and state governments should seek to reform business tax policies by lowering rates to international levels and broadening bases to make the business tax structure more neutral in application. It is a winning strategy to increase investment and economic growth as well as ensure that the corporate income tax is a stable and more efficient revenue collector. Alternatively, a redesign of the corporate tax to be applied to cash flow (expensing of investment costs with no deduction for interest expense) would remove the tax on investment and achieve neutrality. This approach would require personal tax reforms since investors would not be taxed on their investment returns including interest income. In this paper, it is assumed that only corporate tax reform is in play. Corporate taxes have higher economic costs related to the allocation of capital among assets and industries. See Bob Hamilton, Jack Mintz, and John Whalley, Decomposing the Welfare Costs of Capital Tax Distortions: The Importance of Risk Assumptions, National Bureau of Economic Research Working Paper No. 3628 (Feb. 2011). This paper finds that the inter-temporal distortion caused by taxing aggregate investment is the most significant economic cost in this analysis. However, “static” economic costs are also important, especially with respect to inter-asset distortions. Jack Mintz, Neutrality and the Effect of Capital Taxation on Economic Efficiency and Growth, manuscript prepared for New Zealand Treasury (2010). The detailed tenth report providing similar calculations is found in Duanjie Chen and Jack Mintz, The 2014 Global Tax Competitiveness Report: A Proposed Business Tax Reform Agenda, SPP Research Papers, School of Public Policy, University of Calgary (2014). The methodology uses Canadian and U.S. data for capital investments. The analysis is based on the original work of Robin Boadway, Neil Bruce, & Jack Mintz, Taxation, Inflation, and the Effective Marginal Tax Rate in Canada, Canadian Journal of Economics , Vol. 17, 62-79 (Feb. 1984) and synthesized in Jack Mintz, Corporation Tax: A Survey, Fiscal Studies, Vol. 16, Iss. 4, 23-68 (1995). Figures 1 and 2 are updated versions of figures appearing in Jack Mintz and Duanjie Chen, The U.S. Corporate Effective Tax Rate: Myth and Facts, Tax Foundation Special Report No. 214 (Feb. 6, 2014), https://taxfoundation.org/article/us-corporate-effective-tax-rate-myth-and-fact. See, for example, John Steele Gordon, Top Ten Reasons to Abolish the Corporate Income Tax, Wall Street Journal (Dec. 29, 2014), http://www.wsj.com/articles/john-steele-gordon-top-10-reasons-to-abolish-the-corporate-income-tax-1419899269. For a comprehensive review of studies, see Bev Dahlby, The Marginal Cost of Public Funds, MIT Press, (2008), http://mitpress.mit.edu/books/marginal-cost-public-funds. Even if the personal tax is substantially reformed to exempt investment income from taxation (thereby making corporate income unnecessarily taxed), an alternative form of corporate tax is needed on business rents to ensure that earnings are fully taxed at the individual level. For further discussion, see Institute of Fiscal Studies, Tax by Design, The Mirrlees Review, Oxford University Press (2011), http://www.ifs.org.uk/publications/5353. According to the Haig Simons definition of income, capital gains should, in principle, be taxed on an accrual basis. In most cases, capital gains are only taxed when assets are disposed. Pass-through, or flow-through entities, of which income is subject to personal income tax only and not the corporate income tax, account for over half of business income in the United States. See Robert Carroll and Gerald Prante, The Flow-Through Business and Tax Reform, Ernst & Young (2011). Many countries provide tax relief for dividends and capital gains at the personal level in recognition of tax paid on corporate profits to improve both efficiency and fairness of the tax system. The reliance on financing from foreign investors raises different issues at the international level since other governments decide upon personal tax relief measures. A deduction of debt service in the presence of expensing results in a double deduction for the capital by the borrower, because the present value of the returns on the capital are assumed to equal the investment cost, including depreciation and financing. This double deduction can result in a tax loss for the firm but can be offset by the taxation of a similar amount of income to the lender. There is no negative tax on the return to the investment if the borrower and the lender are fully taxable. See Table 3 in Jack Mintz and Duanjie Chen, The U.S. Corporate Effective Tax Rate: Myth and Facts, Tax Foundation Special Report No. 214 (Feb. 6, 2014), https://taxfoundation.org/article/us-corporate-effective-tax-rate-myth-and-fact. The U.S. debate focuses on “territoriality,” which implies foreign income earned by U.S. companies would be exempt from U.S. taxation. However, most countries do not fully exempt foreign source income in the form of interest, rents, capital gains and royalties that are deductible charges in other countries. Instead, countries typically provide an exemption focused on foreign dividends. See Jack Mintz and Alfons Weichenrieder, The Indirect Side of Direct Taxation, MIT Press (2010), http://mitpress.mit.edu/books/indirect-side-direct-investment. For example, the top federal rate, ignoring the investment income tax, is 39.6 percent. At the federal level, dividends paid from corporate profits are subject to a corporate tax rate of 35 percent plus the personal tax rate of 20 percent (high income households) for a total tax rate of 48.5 percent. Thus, a company that pays out profits in the form of salaries and bonuses, interest, royalties or rents, which are only subject to personal taxation, have a tax advantage over companies that distribute profits as dividends.